Mainstream mixed climbing is here. How do we protect the climbs for future generations? We have to be careful. Dry tooling causes damage to the rock. With time, the damage dry tooling causes becomes tolerated, accepted, and sanctioned by some. This will ultimately destroy a rock climb and the experience for future generations of climbers. It’s real simple. Be respectful of the rock and it’s environment. Think about future climbers. Keep your impact to a minimum. Leave as little trace as possible and remember, cumulative damage is always the problem. Some recent posts from Facebook on Dry Tooling. ~Thanks Janet for motivating me to do this post. We need this awareness. I really wish people wouldn’t dry tool and dry crampon rock routes on Cathedral (or at least wouldn’t post photos here or elsewhere of it). That includes Diedre. There, I said it. Indeed, in the 90’s we saw significant rock damage at Rumney from picks and crampons…those scars are (almost) forever! Some thoughts from the Lake District, basically if it’s a popular rock route it’s worth more as such to the general community. Dry tooling should just go away. Janet, even worse is the damn rock climbers thinking they own the cliff and bolting up sport routes where runout winter mixed routes were put up first! Yes! Diedre is climbable as an ice route when it’s in; you don’t have to touch rock on the 5.10 pitch when properly formed. Thinking it’s ok to dry tool when it’s bare rock isn’t so hot. I know it’s a weird trip down ethics lane for visiting climbers, but consider: if there’s no ice on a pitch, you’re ruining a classic rock route for future aspiring leaders. Where do aspiring climbers practice their craft? What are the ethos to preserve the climbing experience for future generations? Can popular rock climbs and dry tooling coexist? -Where do aspiring climbers practice their craft of dry tooling? Dry tooling should be practiced in areas not good for rock climbing and not on established rock climbs. Train and refine your skills on artificial walls. Find areas where rock climbers never go. Most climbing areas now have designated cliffs where dry tooling is accepted. Find out where they are. Go to alpine areas for the best training. 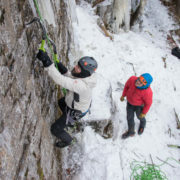 Seek out advice and guidance from professional climbing guides. 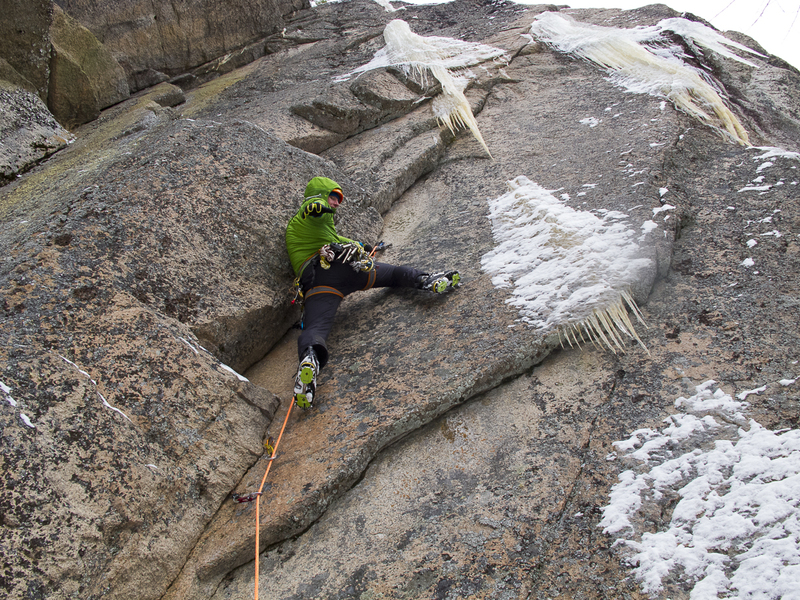 Dry tooling on popular and classic rock climbs with no ice. Scratching your way up a climb. If you are inexperienced and at your limit, think about leaving it for another day. Strong and skilled climbers can often do a climb leaving hardly a mark. Not asking for local information on what is acceptable and where to go. What’s acceptable at one cliff is completely off limits at another. Educate yourself in the local ways. -What are the ethos to preserve climbs for future generations? Think about the damage you may do to the rock if you climb it with ice tools. Think about the cumulative effect of many climbers over time. Think about future generations, and how you might change their experience of the climb. Have the common sense to move on when conditions are not right for a non-destructive assent. Be careful when rappelling. Crampons scratch the rock more during rappels than during ascents. Mixed climbers need to think about their actions to prevent future access problems. -Can popular rock climbs and dry tooling coexist? The universal consensus is that no popular, established rock climb should be dry tooled. If it’s a popular rock route, it’s worth more to the climbing community as a rock climb, than as a dry tool climb. Popular rock routes have been climbed in winter for years, but not with the frequency we have today. We must be aware of the cumulative damage we are causing and take action to prevent it. -How do we deal with excessive traffic on popular climbs? We need to generate public knowledge and awareness of the problem. We need leaders in the community to promote good dry tooling ethics. We need to be specific with what climbs are acceptable to dry tool in a given area and ones that are forbidden. Posting less on social media about sensitive climbs will help keep the traffic down. Posting more on social media about good dry tooling ethics and setting good examples is the right thing to do. 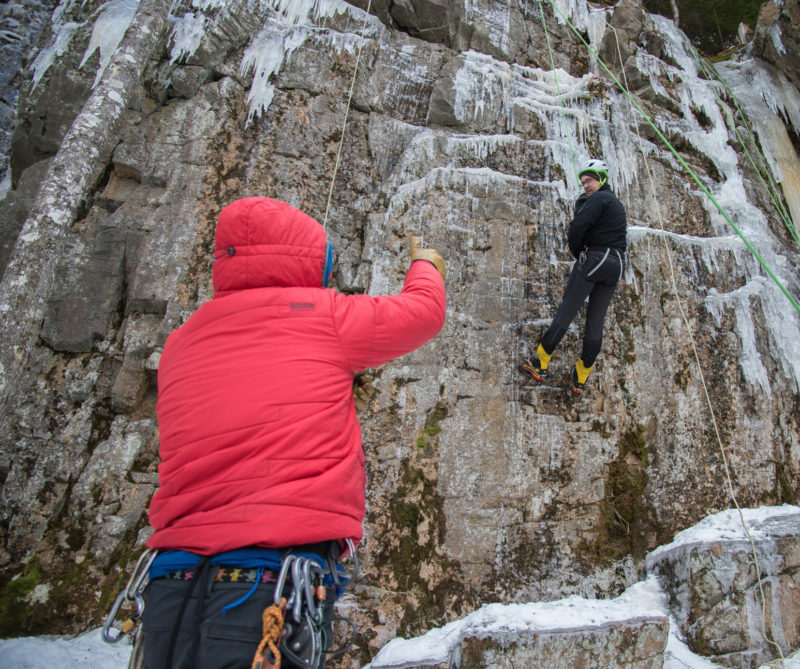 When you are out climbing, think about the damage you may cause before you climb rock with ice tools. Most often, you have two choices. Do, or try the climb, no matter the condition or what your impact might be. Or you can be thoughtful, respectful, and considerate of others, the environment and the future. Make the right choose for the environment and others. Our climbs and climbing areas are a finite resource that we need to protect! https://www.neice.com/wp-content/uploads/2013/01/IMG_8471.jpg 900 1200 NEice Admin https://www.neice.com/wp-content/uploads/2017/10/2012_NEice_logo_oval_blk6-1024x350-300x103.png NEice Admin2018-02-16 17:39:542018-02-16 19:41:02Ethics for Climbing Rock with Ice Tools - "Dry Tooling"
Yes, it’s great to get that early season tick and bragging rights, but the risks are high for those with little experience with early season ice climbing. Are you inexperienced? 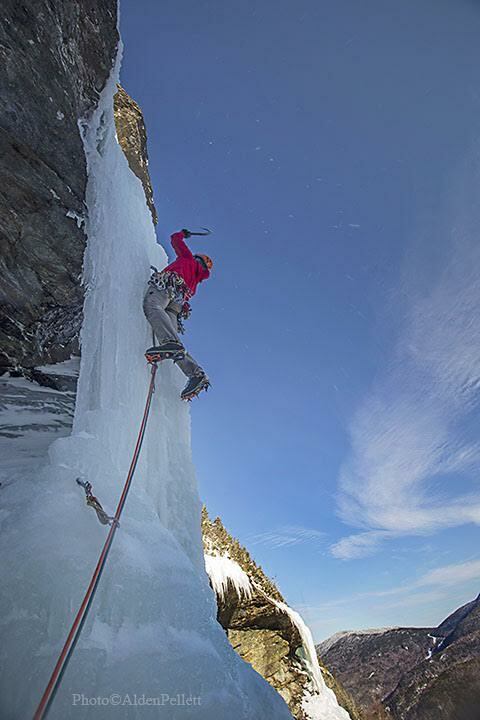 Think before you ice climb and take an honest look at your skill set, gear and abilities. Your life could depend on it. If you climb WI3+ on a normal day that doesn’t mean you can get up a climb of that grade safely in poor conditions. Often WI3+ climbs are for grade WI5 leaders in the early season. Falling ice is one of the biggest hazards in early season ice climbing. Always be aware of the ice above your climb. Early in the season most ice is not well bonded and frequently falls off, especially later in the day as temperatures rise and the sun works the climb. Early starts are best, and most often are mandatory. The 2nd greatest hazard is unbonded ice. In the early season, the water, rock and ground are still warm. Ice will build out with those first few cold days, but the bonds to the earth haven’t been established yet and you will often find hollow spaces under the ice. One must determine if the ice can support your weight and if it’s connected to more substantial ice to let you pass safely. The top outs most likely won’t be frozen turf but wet, soft moss over rock. Sometimes the crux is getting off at the top of the climb. You must be prepared and resourceful. 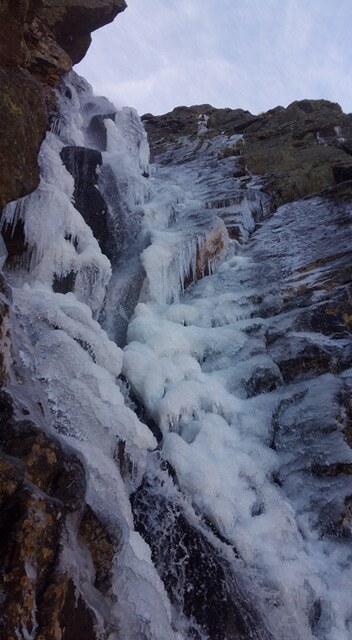 Once I topped out on a climb only to find wet, thin, and delaminated ice with no secure way to make it off the climb. I untied one rope and tied it to my tool and then tossed it up unto the woods where it caught a small tree. Then I “batman-ed” up the rope to safety. Aid climbing for sure, but better than taking a fall. Early season free hanging columns are not safe to climb. They are often brittle and candled. Give them time. 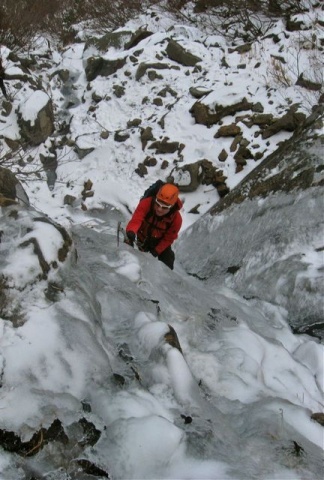 It takes many freeze / thaw cycles to temper and solidify the ice so it is safe to climb. Also, columns may not be well connected at the top and will not support your weight. Early season columns offer poor protection and very poor sticks for the tools due to the new, candled and brittle ice. This is not sport or gym climbing. Most often the gear you get is just for the head and would not hold a fall. 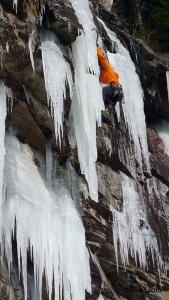 Short screws, Spectres, pins and a small rock rack are standard for most early season ice climbs. Sometimes a small tied off tree in a crack is the best you can hope for. Use anything you can and the more protection you use, the better off you are. At least with a collection of bad gear, it will slow you down should you fall. Keeping the rope away from the water! 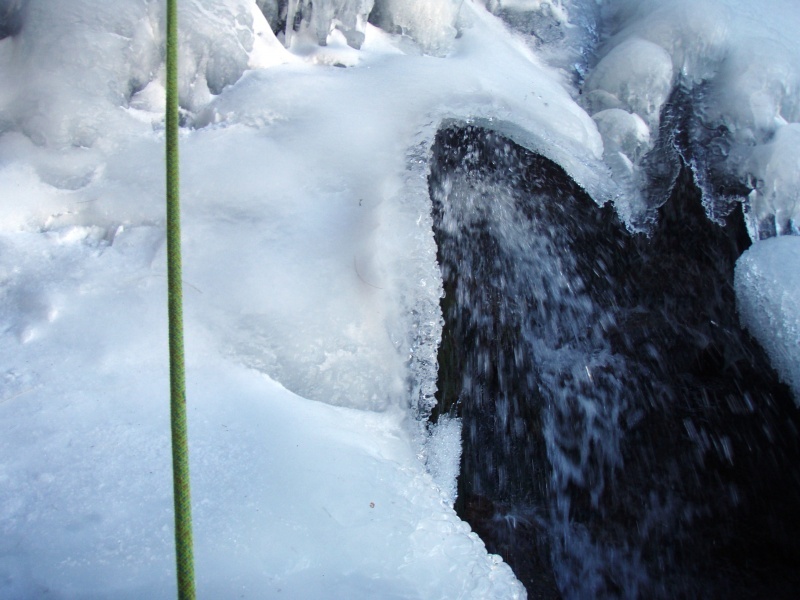 A wet rope is not as strong as a dry one and there is often a lot of water running early season. If it is a cold day, your ropes could get frozen and useless in no time. Dry-treated ropes are best and be sure to manage your ropes, keeping them out of the water. Your old fuzzy rock climbing rope will act just like a sponge. Leave it home. A cloudy day is your friend. 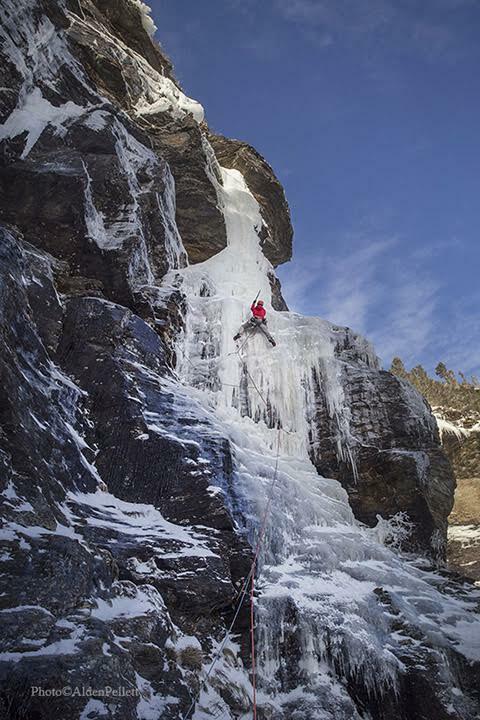 The sun can quickly change the condition of your ice climb. Think about what the sun will be doing when you are on the climb. For instance, the upper reaches of Fafnir on Cannon Cliff gets the sun late in the morning, often showering the lower reaches of the climb and the approach to the Black Dike with falling ice. Think ahead as to where the sun will be shining and where you want to be when the sun hits. Any time the sun leaves or shines on a climb it will cause expansion or contraction. This will cause rocks and ice to move and fall off. 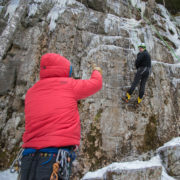 If the forecast is for rising temperatures think about what that might mean for your ice climb. Above freezing temps at night and rising temps during the day should send up a red flag. Be aware of what the temperatures have been leading up to the day of your climb and plan accordingly. Consecutive days of rising temps are not good. One warm day after many days of cold is not bad and may offer good safe climbing. My leg plunges through the crust into the waist-deep snow again. I fight to keep my balance on the slope but find myself in an embarrassing situation: my pack pulling me over backwards, my arms flailing, I am wallowing upside down and swimming in a heavy layer of powder. It’s not my first rodeo post-holing up a steep approach to ice climb in Smuggler’s Notch, Vermont, but this time my pack feels three times heavier than usual. It’s the start of a new year, and like many people traditionally do, I had my New Year’s resolution. I resolved right then and there, I needed to lose some of this weight. 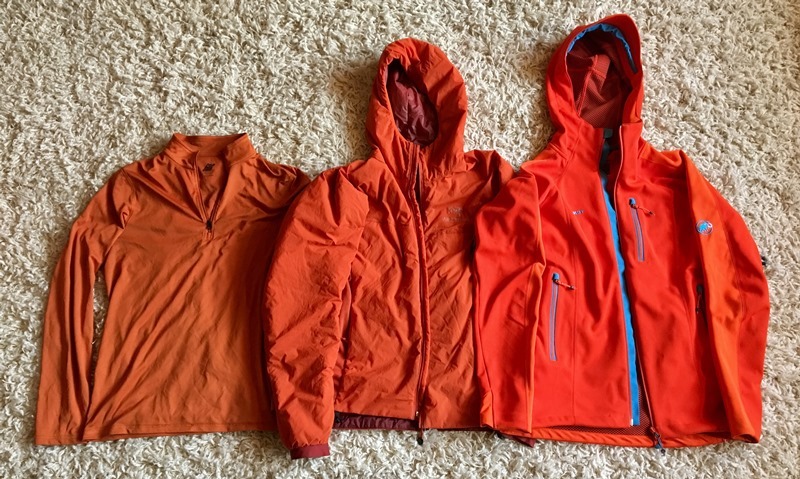 Unless you’re gearing up for a big objective in the Himalaya, the key to success with this gear-intensive sport here in New England often means keeping things as light as possible. So, just because you’re climbing a two to three pitch route at the local crag doesn’t mean you shouldn’t bother keeping the weight off. NEice talked with some of the top guides in the region to hear some of their insights. We’ve gathered a list of tips and tech stuff that hopefully helps you with your own climbing resolutions this year. A week ago, I stood with IFMGA guide Silas Rossi, owner of Alpine-Logic in New Paltz, N.Y., below “Mindbender”, WI5+, at Lake Willoughby. We peered up at the unrelenting steepness and started getting ready to swap leads up some fairly mean-looking terrain. If there is one place in the Northeast that gets you sweating just thinking about how heavy your rack is, it’s there. I caught up with another one of the strongest climbers and guides in the East, IFMGA guide and Piolet D’Or-nominee Kevin Mahoney to get his take on how to improve on my slimming New Year’s resolution. When it comes to mixed terrain and keeping it light, Mahoney says to go for the Ultralight BD cams. 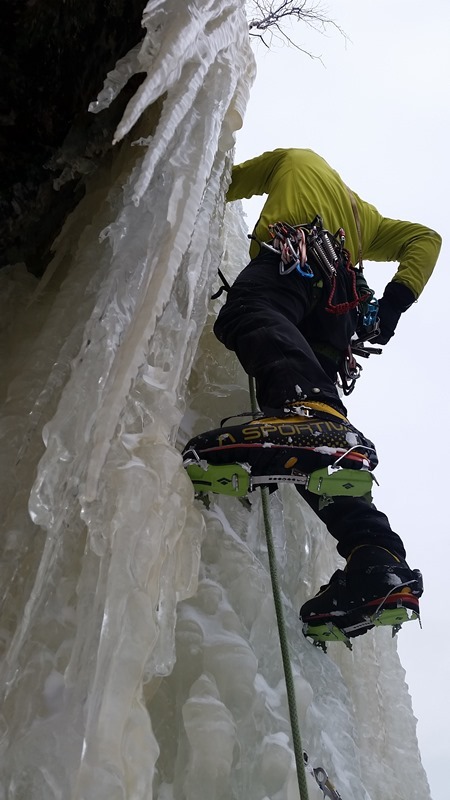 When on ice, he explained, he pares things down even further by sizing down screws and carrying more of the short 10cm rigs. 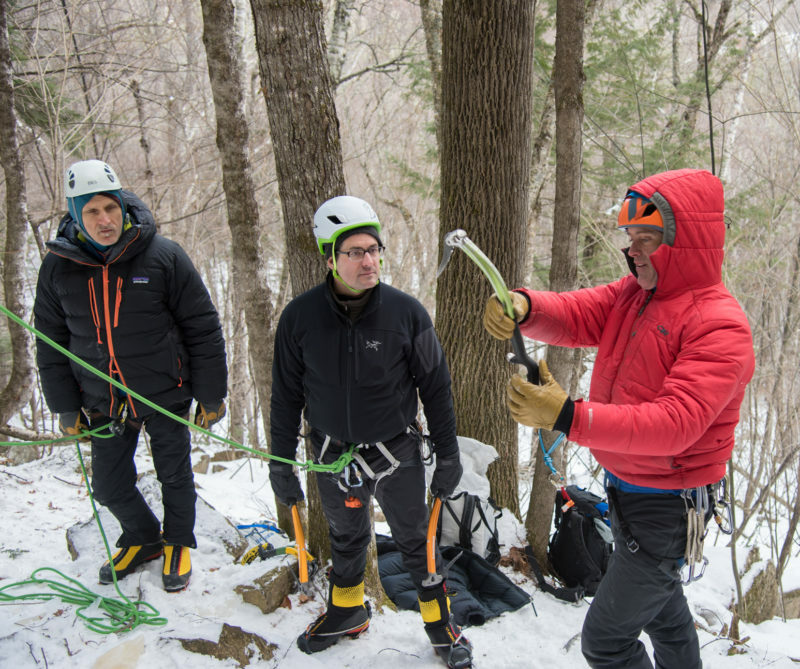 AMGA Rock Instructor and Assistant Alpine Guide, Matt Shove, who runs Ragged Mountain Guides in Plainville, Conn., echoes Mahoney and Rossi, recommending the lightest in new carabiners and slings. To paraphrase Matt, if you’re carrying around ten-year-old carabiners, it’s time to upgrade. Matt is also pretty enthusiastic about one of his favorite lightweight tools, the J Snare. “It’s the lightest ‘V’ thread tool. There are no sharp points, so it won’t shred your pack, your expensive belay parka, or more importantly, your lunch.“ In fact, we at NEIce are witnessing many guides putting this baby on their racks this winter! Petzl Laser Speed Light screws: These babies are sharp! They bite into ice ridiculously fast and weigh next to nothing. They cost more than others but on a long pitch or route, the weight savings is really a game changer. Some of our test guides say they don’t seem as durable over time as the Black Diamond’s Turbo Express screw, but for ‘fast and light’, there is really no substitute. Mammut Twilight 7.5mm ropes: Got the feeling that your rope is trying to pull you off the climb? At 38 grams per meter, you’ll shave some real pounds off the trek towards that big route with the latest in skinny ropes. At times on some difficult ice leads, I’ve almost forgotten I have these tied to me. Beal makes an even skinnier set of ropes: their Gully 7.3 Unicore ropes. Regardless of the brand, these thinner models thread nicely into the ice for rappels, leave no trace, and make carrying extra cordage up a route for descents almost obsolete. 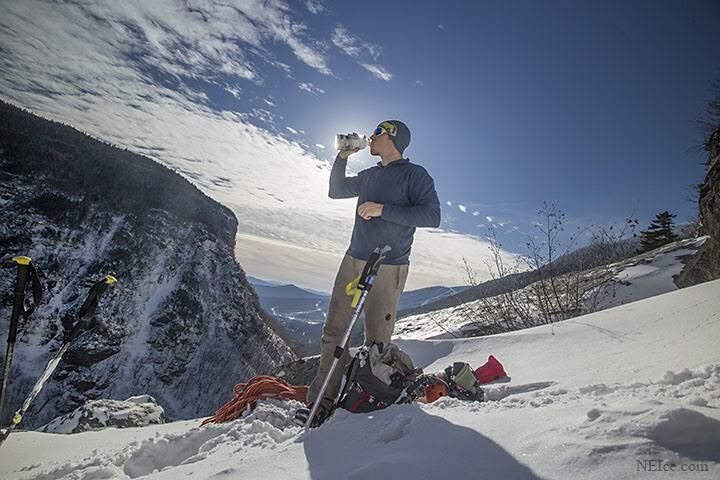 Patagonia Galvanized pants: Superlight with all the features an ice climber needs including suspenders. NEIce founder and longtime gear tester Doug Millen says he’s run these pants all over the White Mountains this season already. From soloing long easy routes to beating them through deep snow approaches, they’ve performed for him, no complaints. Stanley Adventure Stainless Steel 17 oz. vacuum bottle: Personally, this is one tool I won’t ever go without on a cold day of ice climbing. At under a pound dry weight, I bring it up anything longer than a single pitch. A good cup of hot honeyed ginger tea before leading up a steep pitch is worth its weight and this is a sweet rig that takes a beating. Stanley also offers larger sizes but this fits right in my ruck alongside my puffy belay parka. Lightweight carabiners: There’s so many now that it’s hard to pick just one brand. Petzl’s Attache’ locking carabiner is a popular one, and at just 56 grams, it’s a keeper. Pair one of those with Mammut’s Wall microlocks (47 grams) for safe clip-in points at the belays and you might start seeing the slim results in the mirror. DMM also offers a super light version: The Sentinel MS locker ticks in at 54 grams. Like I said, there’s a lot of choice out there. For this category, it won’t hurt to take a trip to your local gear store and watch the pounds melt off your rack. The main purpose of your base layer is to wick moisture away from your body. This is your first line of defense because if this fails, your whole system will fail. First and most importantly, do not ever use cotton products. Cotton products will wick a small amount of moisture away from your body but will not rid the moisture completely or properly. Cotton acts like a sponge and if you are wearing wet cotton in cold temperatures, your body will struggle to stay warm. In an alpine environment, this can lead to numbers of issues, including hypothermia. On your cold zero dark thirty (12:30am) start right out the tent, you may feel the need to pile the layers on. Once you get moving, however, you’ll find yourself heating up. Start managing that heat so your base layer can manage the moisture. You have a long day ahead and if you get wet early its gonna be even a longer day! The two common base layer fabrics are wool and synthetic. Which one you decide to use is a matter of personal preference. Synthetic layers include the poly-groups (polyester, polypropylene). Synthetics are generally inexpensive, dry very quickly, pack down efficiently, and tend to be quite durable. The downside is that they provide little insulation and therefore, only a small amount of body-warming qualities. Some claim poly fabrics retain odor, but usually you have bigger concerns on a climbing trip than having stinky clothes! On longer, two month expeditions, I often take my synthetics and wash them in a large hot water bowl with soap, lay them on my tent and after a few hours in the sun, they are clean and good to go. Wool has seen many improvements recently and has made a strong comeback into the outdoor clothing industry. The common wool used is known as merino wool. Efficient insulating properties and excellent breathability are wool’s top trademarks. Wool comes at a price, typically higher than synthetics. One of the common complaints of wool is that it can be itchy. If you decide to dunk your wool in a bowl of hot water, you should certainly expect it to take considerably longer to dry than a synthetic. • Consider getting a quarter zip top to assist with dumping heat during periods of high output. • Dedicate clothes to sleep in and clothes to climb in. At the end of your epic day, when you’re with your partner sharing a whiskey, get out of your climbing clothes and allow yourself to yourself to mentally and physically recharge.Think of it like getting out of your work clothes at the end of the day. It might take some effort, but if you sleep better, you will climb better. • Consider a one-piece base layer. Picture yourself at home, wrapped snugly in a one-piece, keeping you toasty on the couch by the fire. Pretty sweet, eh? Alpine onesies are the same, except there probably isn’t a cozy fire or a couch where you are going to be. Onesies are quite comfortable and leave fewer cold spots and areas for the cold and snow to creep in. I pretty much guarantee once you have one, you will wonder why you didn’t get it sooner. Thank me later! 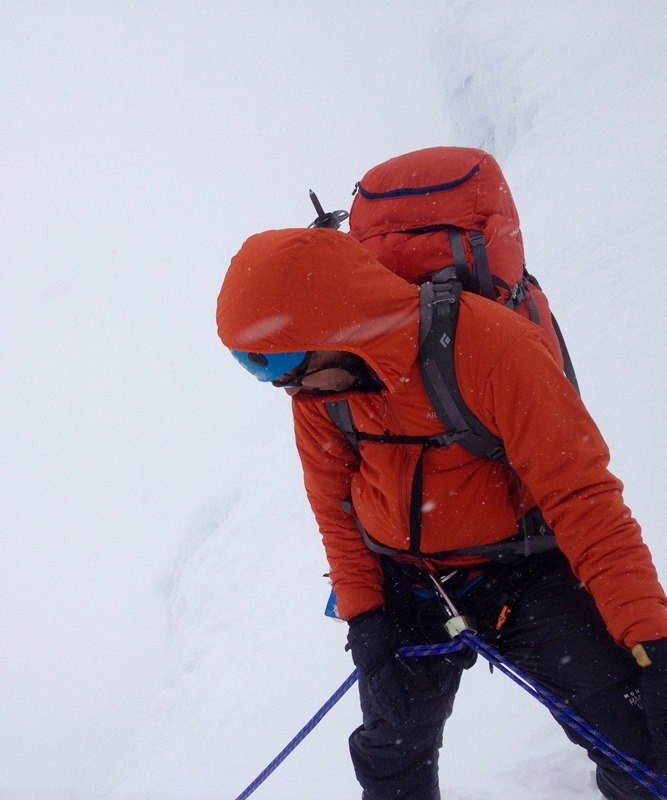 Using quarter zip synthetic base layers on the Kautz Glacier, Mt Rainier. A lot of companies are in the market today making gear. What works for you might not work for the next guy. Layering is as much an art as it is a science. Fit is extremely important and requires good ole trial and error. Just because all your flannel shirts at home are size M does not mean your size M for all of your climbing outerwear. Different companies cut items in different and sometimes mysterious ways. Take the time to dial in fit from your base layers to your harness. Your insulation layer’s primary role is to keep you warm and to regulate your temperature though breathability. Insulation can come in the form of fleece, which can be broken down into several different weights (100, 200, 300) combined with several other technical fabrics (windstopper, etc…). In alpine climbing, loft insulation is considered the benchmark where warmth is key. There are generally two types of loft insulation: synthetic and down fill. Synthetic Insulation: In short, synthetic insulation jackets have come a long way. In today’s market, there are several synthetic jackets geared towards climbers that perform very well. Gone are the days where down fill insulation was simply unmatched. Top brands have developed jackets to handle your entire day start to finish, from a high output ski approach, to swinging tools, to a quick summit tag in full raging conditions to the long descent back to the car. These jackets that once didn’t pack so well now pack very nicely. While down fill still remains the best insulator, the biggest improvement with synthetics is the breathability factor and the jacket’s ability to regulate temperature. The clammy feeling that went along with synthetics is a thing of the past. Synthetic jackets can dry fast when wet and continue to keep you warm when wet. Synthetic jackets remain at a lower price than down jackets and for the earth conscious climber, many jackets now have insulation produced from recycled materials. When considering any piece of gear, imagine how it looks on a scale of use. How many functions does the piece of gear serve? Does it reduce redundancies so you are not carrying three of the same thing? Most of the time it pays large dividends to have a piece of gear that can do many things. 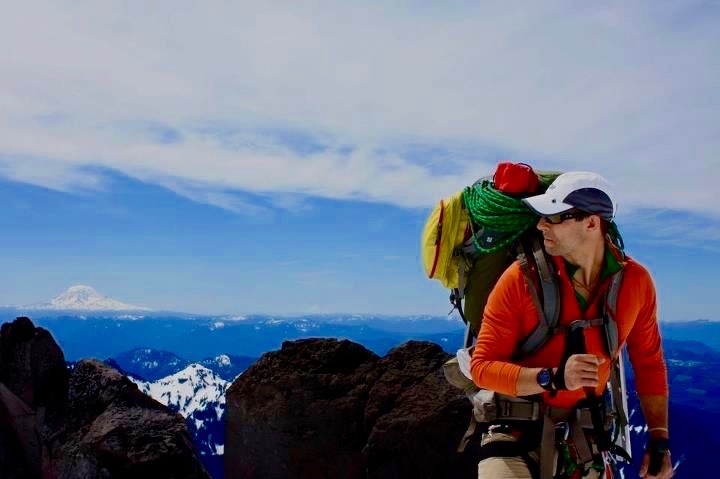 Ensuring your gear or clothing can serve a multitude of purposes can make packing easier, the weight you carry much less and the gear you have to manage less stressful. When you have redundancies in your pack, you may feel overwhelmed by the amount of items you have and that can damper your experience. Down Fill Insulation: For those venturing into the mountains where the cold is a major factor, down fill insulation is the gold standard. Down-fill insulation comes in several weights, from lower grade 550-fill to a no compromise 900-fill power. Fill power measures the amount of puffiness, which directly effects the amount of air the down fill can hold and ultimately insulate. Fill powers commonly seen by alpinists are 600, 750 and 800. I generally recommend utilizing down at 750-fill power and above. If the fill weights are still a little confusing, think of the lower grade down fills as ones you would use to walk around town. When in the mountains, having higher grade down really does make a lot of difference. To see first hand, go to your local store and compress a 600-fill jacket and then compress an 800-fill jacket. The compressibility makes a major difference. When down is taken care of it last several years and continues to keep you warm like no other product. Down has excellent breathability and packs down like a dream. The negative: down is always priced higher than synthetics and the higher the fill, the higher the price. Down is also useless if it becomes wet, so be very conscious of the condition of your jacket and limitations of your jacket shell. Overall think of your down jacket as an investment piece of gear and if you take care of it, it will take good care of you. Your shell layer is your main line of defense against the elements. Your shell layer keeps your insulation layer, your base layer and you dry and warm. Shell layers are built to take a beating. They come in two different constructions: hard shell and soft shell. Soft Shell: There are a few major differences between soft shell construction and hard shell jackets. Soft shells are designed with fabrics with superior ergonomics, performance and movement in mind. The user will experience a jacket that “flows” and wears much smoother with them than a hard shell. Many different types of fabrics are used in soft shell construction and each provides a very different experience based upon activity type and conditions. Soft shells are more breathable than hard shells, but they do a mixture of repelling and absorbing the outdoors. They don’t completely protect you against snow, wind or water, so the trade off is performance and comfort versus weather defense. All soft shells are going to respond to weather differently, so it is important you try to dial in the comfort level you have with your jacket slowly. Consider using a soft shell for shorter trips, roadside ice or places where you are very comfortable with conditions. Hard Shell: Hard shell jackets are the ultimate guard against the elements. A hard shell will use materials that do not allow water or wind to penetrate the fabric. The downside to this defense is that the fabric does not breathe as well as a soft shell. Another downside to the hard shell is lack of ergonomics and how the jacket wears during activity. The hard shell is going to feel a little bulkier and have a general lack of smooth movement. Both soft and hard shells are pricey but hey…what isn’t in climbing anymore? 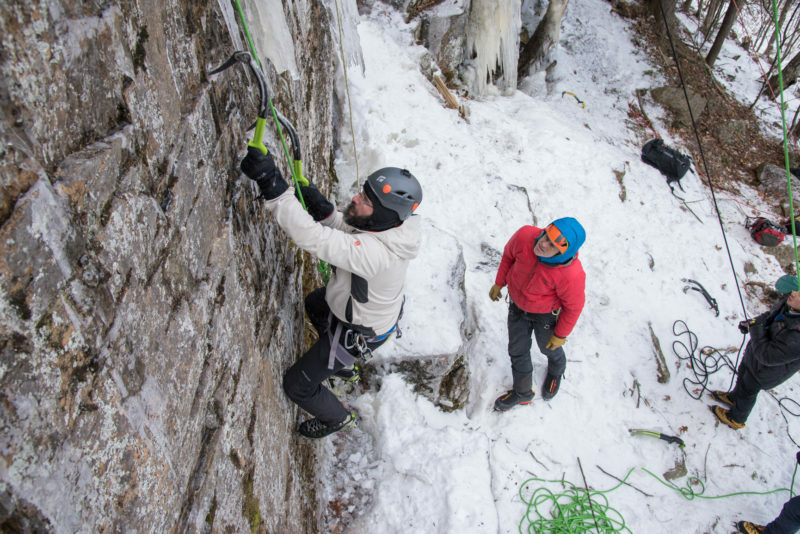 For epic cold outings bring a belay jacket. When your up at Lake Willoughby ripping up Twenty Below Zero Gully and your soul is on its way to being frozen stiff, a belay parka may just save you! A belay jacket provides the highest levels of warmth and protection when mountain conditions begin to rage on you. This jacket earned its title for saving you during the periods of time when your caught on the belay ledge while your partner stitches the last pitch and the mercury has seriously begun to dip. The belay jacket will allow you to remain warm and focus on your belay duties instead of suffering from the cold. On the flip side, a belay jacket is also great in big mountain base camp settings, or just back at the climbing cabin when your just hanging around by the stove waiting for your partner to make a hot brew and heat up the tasteless evening gruel. The versatility of this jacket that excels in the field, and on your downtime makes it a staple in every climber’s closet. A belay parka/jacket is cut two different ways. The parka is cut bigger and will usually cover your harness and have a bulkier feel. A jacket will be waist cut and fall just above your harness. Which you pick is just a matter of preference. Sometimes the parka zipper can come up a bit from the bottom and this will allow you to clearly see your belay loop, tie-in knots and such. While in the field, keep in mind you will be taking this jacket on and off and stuffing it in your pack constantly. This jacket will be taking a good beating, so pick a good one. To wrap up, I hope this helps with all your layering needs. Dial in your alpine costumes at home before you head out. Buy the gear you like and don’t make a habit out of compromising. If you like your gear, you’ll look good; if you look good, you’ll feel good; if you feel good, you’ll climb good, and if you climb good, you’ll be happy! 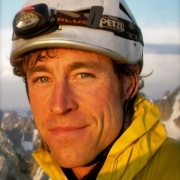 About the Author: William Bevans is a New England based alpinist with over 20 years of experience in the mountains. His studies are concentrated in the area of technical alpine and high altitude mountaineering. He has completed climbs and led expeditions in the Cascades, Rockies, Alps, Himalayas, Andes, and big walls in Yosemite, Zion and Mexico. Currently he is involved in mentoring next generation alpinists and climbing the New England classics. 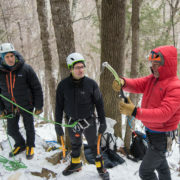 A great article from local New Hampshire guide, Peter Doucette of Mountain Sense Guides on how to manage ice fall during climbing.